Extinguish anger forever and find true happiness with this step-by-step guide. Anger is a potent poison that ruins health and damages relationships. In today’s world of Twitter feuds, road rage, and internet trolls, it is all too easy for anger to grab hold of us. This timely book offers practical advice on how to put aside anger and ego and embrace laughter and reason. Like a friendly family physician, Venerable Sumanasara helps you see what triggers your anger, what affect it has on you, and what you can do about it. Maybe you have trouble at work or at home, maybe you had a difficult childhood, or maybe you just get angry in traffic. In short, bite-sized chapters, he offers wisdom, along with a laugh, that you can use. 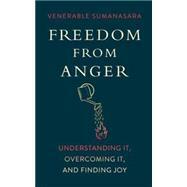 Drawing on easy-to-follow metaphors and parables from a variety of cultural traditions, in an accessible, conversational style free of dogma, Venerable Sumanasara shows us how to manage our emotions so that we can lead healthier, happier lives finally freed from anger. Ven. Alubomulle Sumanasara, a Buddhist monk schooled in the Theravada tradition, has written more than one hundred books addressing the practical application of Buddhist thought and practice to daily life. Born in Sri Lanka in 1945, he became a novice monk at the age of thirteen and was ordained in 1958. After teaching Buddhist philosophy at the University of Kelaniya, he first went to Japan in 1980 to study Japanese Buddhism on a fellowship from the Sri Lankan government, pursuing his doctoral studies at the graduate school of Komazawa University. In 1994 he established the Japan Theravada Buddhist Association, through which he continues to spread the Dharma and lead others in the practice of vipassana meditation. Sumanasara’s sincerity and gentle manner, as well as his facility as a speaker in both English and Japanese, have earned him a broad following. Focusing on the fundamental teachings of Buddha, he explains how Buddhism offers down-to-earth wisdom that anyone can put into practice to better understand and manage the challenges of the here and now. He lives in Tokyo.